Mannivakkam is an upcoming locality in Chennai, situated towards the city’s southwest region. It is located in Kattankolathur City in Tamil Nadu with the postal head office at Vandalur. Mannivakkam is surrounded by a number of popular Chennai metropolitan suburbs including Karasangal, Bharati Nagar, Bharati Nagar, Mudichur and Vandalur. In the past few years, Mannivakkam has seen tremendous commercial and residential growth, further driving development and social infrastructure in the area. Read on to know what makes Mannivakkam an ideal location to move to or invest in. Like most suburbs in Chennai, Mannivakkam, too, is well connected to all parts of the city. Since this locality is situated west of Tambaram, it sits on the State Highway that connects GST Road to Oragadam from the Vandalur Junction. Mannivakkam also offers unparalleled accessibility to all parts of Chennai and surrounding suburbs via arterial roads namely GST Road and Chennai Outer Ring Road, state and national highways including NH4, NH5, NH45 and NH205. Located in Chennai’s southwest region and west of Tambaram, Mannivakkam is situated close to several other well-known suburbs and districts. Tambaram is located 7.5 km away from here. Other prominent areas situated along the GST Road in close proximity are Perungalathur, which is 6.4 km away, Vandalur is 4.4 km away, and Urapakkam is 6.1 km away. If you travel a little further, you will find a few more suburbs namely Manimangalam which is 7.6 km away; Guduvancheri is 7.3 km away, and the Tambaram railway station is 10 km away. Several reputed banks namely HDFC Banks, Karur Vysya Banks, City Union Bank, Lakshmi Villas Bank, Indian Overseas Bank, etc. have branches in Mannivakkam. The increasing urbanisation of Chennai has given rise to a number of rapidly developing suburbs and burgeoning localities, and Mannivakkam is one of them. 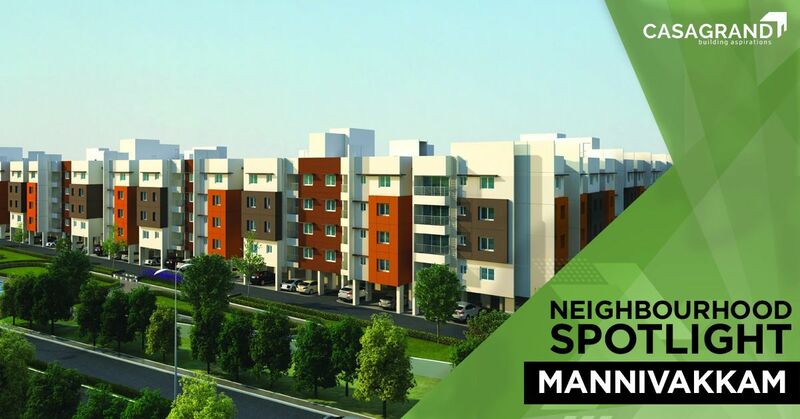 With great social infrastructure and a good balance between commercial and residential projects, Mannivakkam is well on its way to becoming a real estate hotspot just outside the city of Chennai. If you’re looking for your next ready-to-occupy home, be sure to keep Mannivakkam in mind. For patrons interested in luxury apartments, head over to Casagrand Miro located just 15 minutes away from the Tambaram Railway Station. Visit Casagrand for more information about this project and other residential properties in Mannivakkam, Chennai and other cities in India.